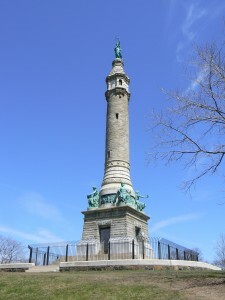 The 110-foot tall Soldiers’ and Sailors’ Monument high above New Haven is visible for miles on a clear day. 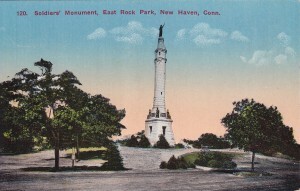 The monument, at the summit of East Rock Park, was dedicated in 1887 to honor soldiers and sailors who fought in the American Revolution, the War of 1812, the Mexican-American War and the Civil War. 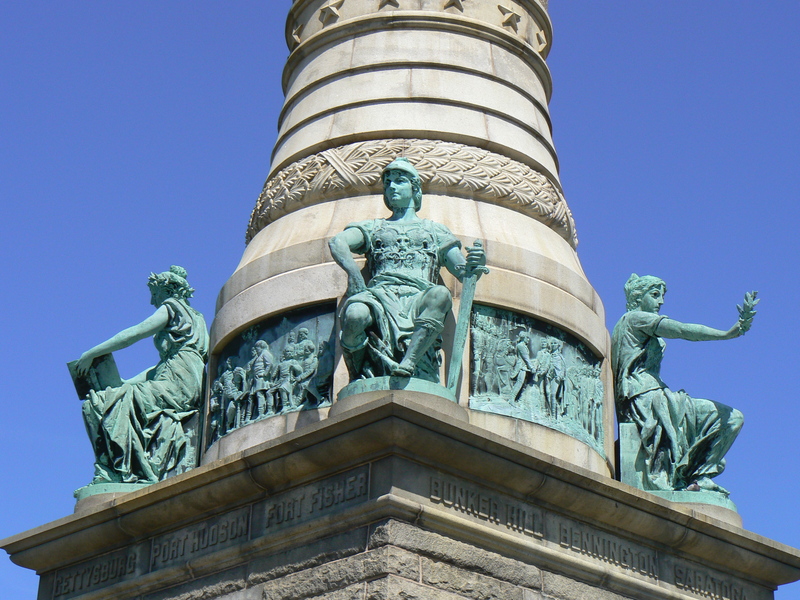 Four allegorical statues appear on the corners of the monument’s base. The west corner depicts History holding a book, and the south corner symbolizes Patriotism holding a sword. 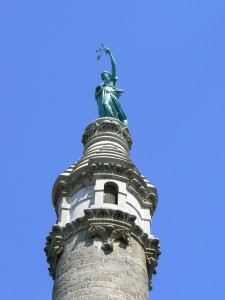 The east corner represents Victory, and the north corner depicts Prosperity. The front (southwest) face of the monument honors the Civil War, and lists the battlefields of Gettysburg, Port Hudson (La.) 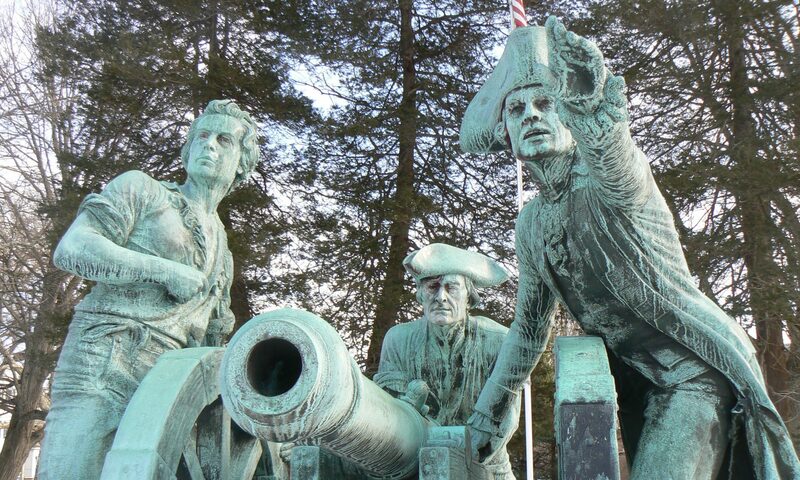 and Fort Fisher (N.C.). 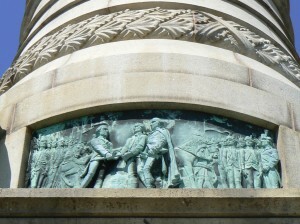 A scene on the southwest face depicts Robert E. Lee’s surrender of the Army of Northern Virginia at Appomattox Court House, Va. in April of 1865. In this scene, Lee appears to have a painful headache, which, under the circumstances, is probably understandable. 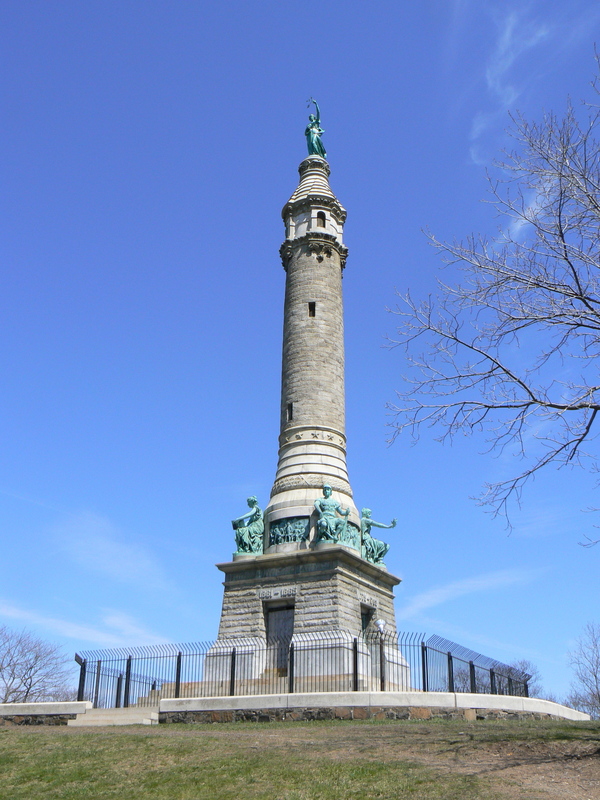 The southwest face also has a door to the interior of the monument that has been boarded over, probably because the interior staircase to the upper-level viewing area has reportedly fallen into disrepair. Moving to the right, the southeast face of the monument honors the American Revolution by listing the battlefields of Bunker Hill (outside Boston), Bennington (Vt.) and Saratoga (N.Y.) below a scene depicting the British surrender at Yorktown. 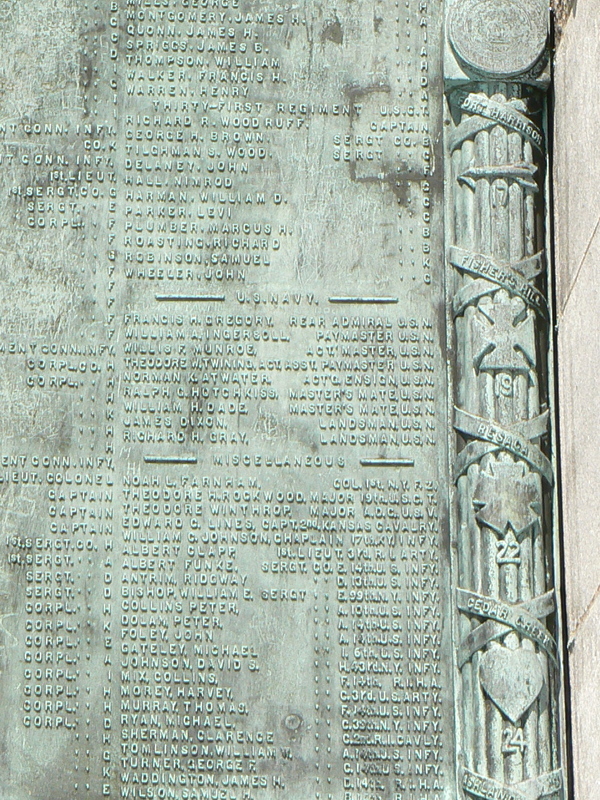 The southeast face also bears one of two large bronze plaques with 520 names of soldiers and sailors from New Haven who died in the Civil War. 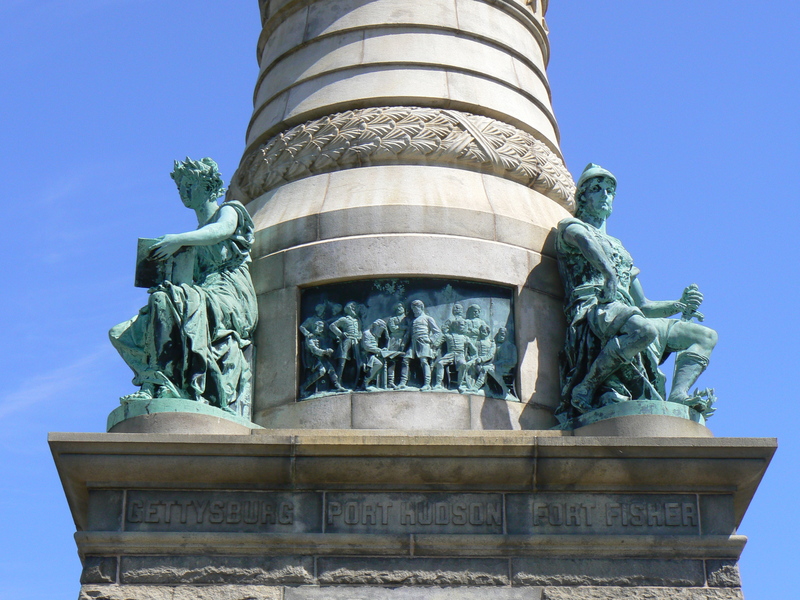 The plaques, which were added to the monument in 1894, have ornate decorative borders with raised moldings and ribbons that feature regimental emblems and the names of Civil War battlefields. 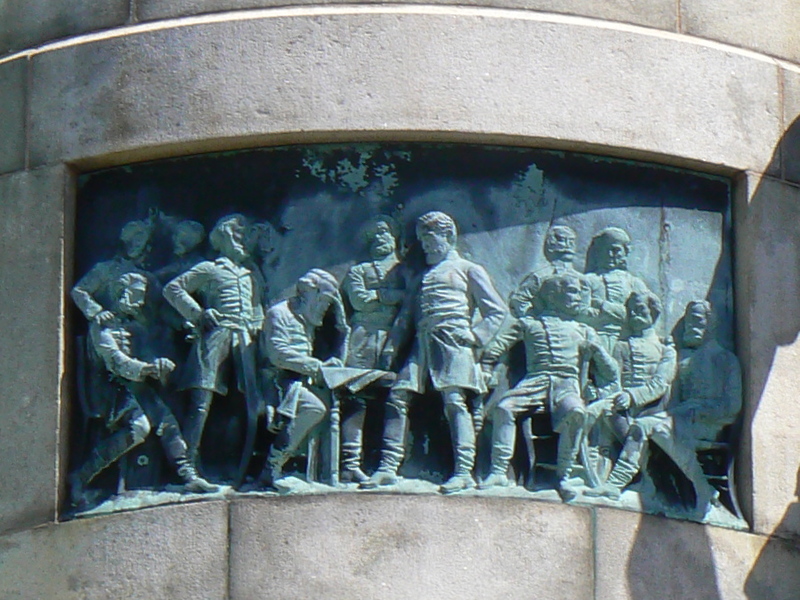 The plaque on the northwest face is substantially darker than the plaque on the southeast face, and along with the scenes on this and the northeast face, could use a good cleaning. 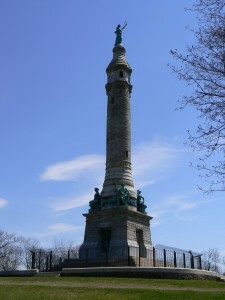 The northeast (rear) face of the monument honors the War of 1812 by listing battlefields near Lake Erie, Lake Champlain and New Orleans and a hard-to-discern naval scene. The rear face has a doorway that is either false or has been cemented over. 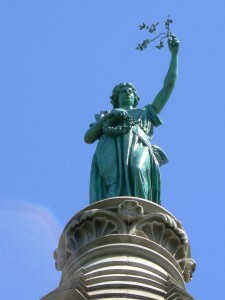 The northwest face honors the 1846 Mexican-American War by listing battlefields near Palo Alto (near Brownsville, Texas), Molino Del Rey and Chapultepec. 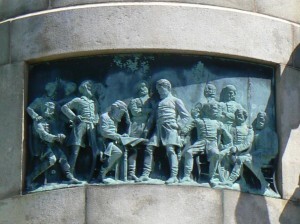 A scene from that war appears above a second plaque listing local Civil War heroes. 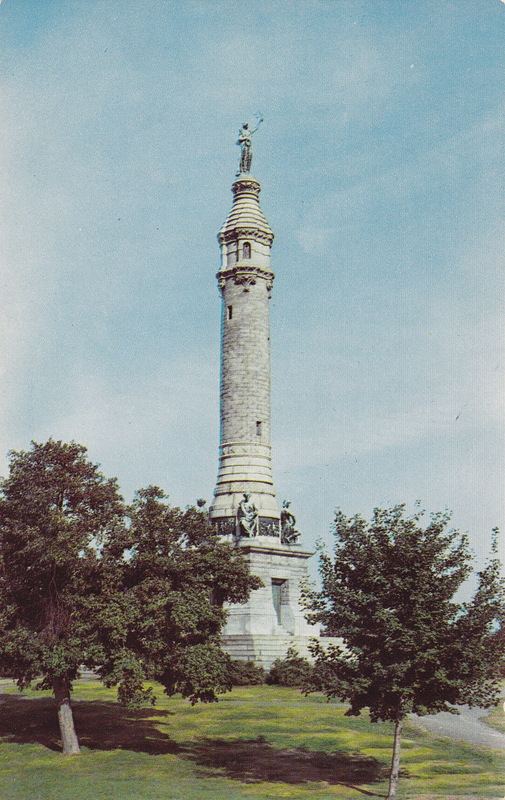 According to the Connecticut Historical Society, the monument’s dedication in June of 1887 was attended by Union generals William Tecumseh Sherman and Philip Henry Sheridan. 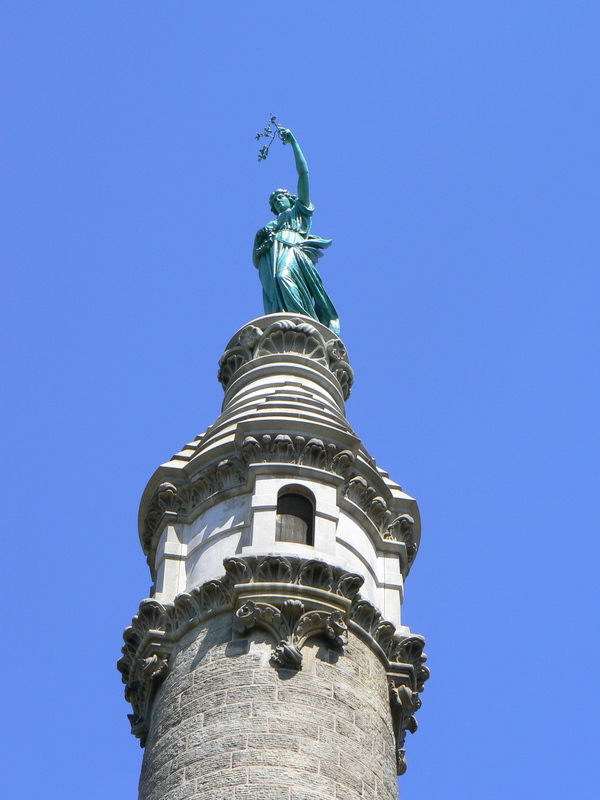 A parade of 20,000 people was watched by a crowd estimated at more than 100,000. 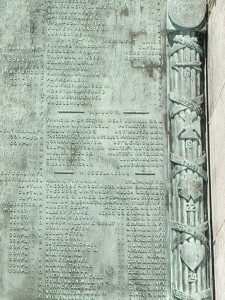 The plaques listed the Civil War dead were added seven years later. As you can see from the vintage postcards appearing below, the monument’s surroundings have changed over the years. In the first postcard, a small pavilion that stood at the summit appears neat the center of the image. 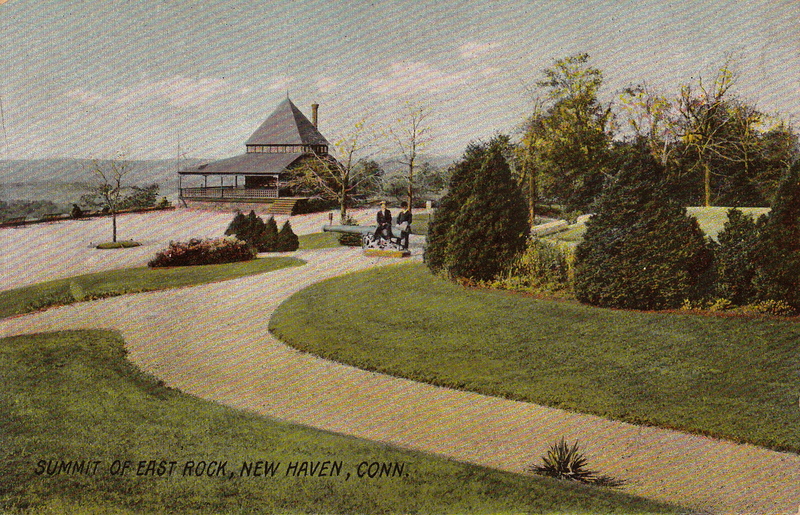 The pavilion is gone, as is the cannon the gentleman appears to be sitting on, but the pavilion’s foundation remains. 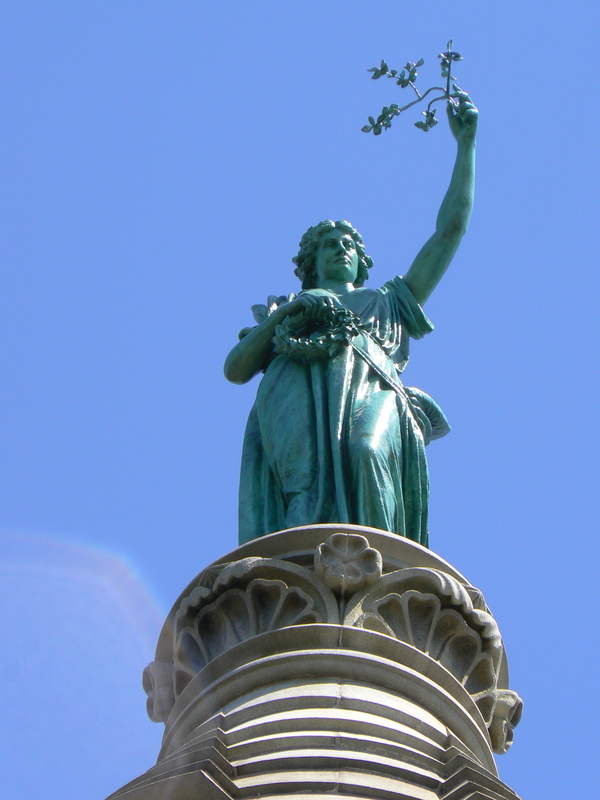 Over the years, a small plaza and fence have been added to the monument’s base, probably to discourage vandalism or theft of the bronze plaques. The vertical postcard with the small trees in the foreground was mailed in 1954 from New Haven to Cleveland. 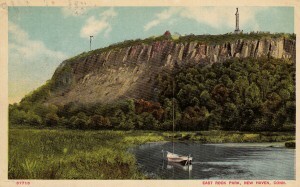 The postcard depicting the cliff under the monument was postmarked in 1910, and mailed from New Haven to Dwight, Mass. The final image in this post is a panorama shot taken from the parking area in front of the monument, looking south toward New Haven harbor, downtown New Haven and the West Haven shoreline.